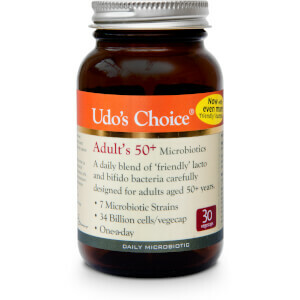 Udo's Choice Adult 50+ Blend Microbiotics provide an easy-to-consume daily blend of ‘friendly’ bacteria (probiotic), specifically selected for over 50’s, to support the immune system functionality and encourage proper digestion. Microbiotics are the beneficial lacto and bifido bacteria that occur throughout the digestive tract and are essential in replenishing healthy gut flora, which helps to reduce gas, bloating and constipation. 34 billion cells per capsule, including: Lactobacillus casei (HA-108): 30%, Lactobacillus rhamnosus (HA-111): 20%, Lactobacillus acidophilus (HA-1220): 10%, Lactobacillus plantarum (HA-119): 10%, Bifidobacterium bifidum (HA-132): 10%, Bifidobacterium breve (HA-129): 10%, Bifidobacterium longum (HA-135): 10%. Consume 1-3 capsule(s) per day on a full stomach, or as directed by your health care practitioner. Do not exceed the recommended daily intake. Food supplements should not be used as a substitute for a varied diet. Store out of reach of young children. Not suitable for children under 4. Keep refrigerated. Potato Starch (diluent), Freeze-Dried Bacterial Cultures, Ascorbic Acid (Antixoidant), Stearic Acid (Emulsifier), Silicon Dioxide (Flow Enhancer). Capsule: Hypromellose.